As a new student here at Southwestern Adventist University, I was nervous about attending this school, not only because it would be a new start, but also because I have gluten intolerance. Many schools I have attended in the past did not offer gluten-free options, especially since most meat analogues do contain gluten as a main ingredient. Usually this meant that I would have to survive off the salad bar and rice and beans (if it was served that day), or I would have to purchase my own meals from the grocery store while attending school. While grocery shopping is a viable option, it is not at always convenient for the busy life of a college student. Unfortunately, the first semester here at Southwestern was not all that different from the other schools that I attended. 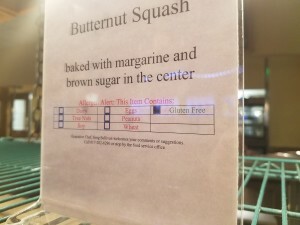 I still had to rely heavily on the salad bar as well as the signs containing allergen information that are placed above the food items on the main bar. I was happy to find, however, that my options were greater than other schools, so I had no complaints. However, at the beginning of the second semester, Chef Greg announced that he wanted a count of all the students on the meal plan that needed gluten-free food options. I was one of the first to sign-up, and I’m so grateful that I did. Now I have access to a gluten-free option at nearly every meal, such as gluten-free pasta, bread, burgers, hot dogs, pizza and pancakes. Sometimes, they even make gluten-free cookies and brownies! If you’re a student that is currently attending Southwestern Adventist University that needs gluten-free options, I highly recommend talking to Chef Greg. If you’re someone who is thinking about attending Southwestern, but have concerns about whether or not your gluten-free needs will be met, don’t worry any longer. Thank you, Chef Greg and team, for giving us gluten-free eaters options on your menu!